Harris: You talked about an experience with a python. What about encounters with poisonous snakes? Mansur: One of the worst was in the Katingan River which runs through to the west of the Kahayan River, way, way up river, actually where Bapak told us to live. This was one of those jungle latihan experiences. We were going off to work along a jungle path, and we had a young guide who was our out-front guy. I had wandered off the path and he turned around and called me. And as he did that, not looking where he was going, he trod on this huge king cobra. It was about four meters long and I was next in line. It was one of those moments that just went into sort of freeze frame. I’ve seen it in the movies, but this was real life. The snake was raised to strike, and this was a tiny little guy, the snake was literally taller than him striking down at him. He was trying to avoid it with kung fu-type moves; they all know a kind of martial art defence. So he’s brushing it off, and everyone else ran away, and then the snake looked around and there I was. I instinctively turned to run, but managed to fall in a hole and completely dislocated my back. I couldn’t move. And as I fell I thought, “Oh dear, here it is! 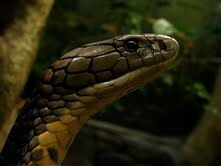 Death, by King Cobra!” In my mind’s eye, I could see this fanged thing coming cheek-to-cheek with me in the next five seconds. I had a big mandau knife that I always used to carry for cleaning the pathways and stuff. I thought, do I want to go arm-to-arm with this bugger? And I thought, there’s no point, l ain’t going to win. So I just went completely limp. The thing sure enough came up and pretty well kissed me on the nose with his huge, long, flicking tongue and looked at me as if to say, “OK. Yeah, you’re not that interesting.” And went away. The strange thing was I felt entirely calm through this whole encounter. Mansur: I gathered myself together. I managed to stand up, but I realized something really bad had happened to my back. There were about five of us who had all scattered, and we came back together and walked down to the river about 50 meters away where I found the young kid on the riverbank. He was sitting there very calmly and he said, “I’ve been bitten”, and there were these two enormous puncture marks in his groin. Then the interesting thing that happened was that we all instantly went into prayer. And this kid was completely calm. And then my original guide, Pak Sumbin, disappeared into the forest and came back about two minutes later with a chunk of wood which was oozing white sap,its called a pohon kupang. So we tried to wash the wound and then rub this sap on. You couldn’t cut the bite, it was right in his groin, and you couldn’t tourniquet it. I pulled Pak Sumbin aside and asked, “So what’s the story?” And he said, “Well, if he’s conscious in 20 minutes, that’s a good sign. And if he isn’t dead in three hours, he might well make it.” We were days from anywhere. We had no means of calling up a big company helicopter for support or evacuation. I went back to the little kid and he said, “Yeah. Well don’t let me be a bother to you. You need to go on about your busy day I’ll just lay here and die.” These people have a remarkably surrendered nature. But that’s not the end of the story because when they looped the stretcher and put him on it, and we’re going to carry him out, we walked past this huge clamp of roots, one of these big Baringin trees. The snake had gone in there. So we all walked by it, and then the snake came straight up and went lunging at the same guy on the stretcher. Harris: The same guy again? Mansur: Same guy. I didn’t know why it didn’t bother with anyone else, but he was just pissed with that guy. Maybe because he was the one who had trodden on it? They must have some kind of primitive memory. Harris: But you mean it doesn’t like to waste it? So the next day we took him straight down to find a hospital, and I was realizing more and more that something was really wrong with my back. By the time I got back to Jakarta I was really in a bad way, I couldn’t move, and I ended up having horrendous back problems for a year. Harris: And the boy survived? Mansur: Yeah, he came back about two months later and said, “I want to go back to work.” And we all looked at each other and said, “Well OK.” And he came back but every day we walked up a river I noticed that if he was in the front, we’d meet a snake. So we ended up calling him Snake-Bait. “Okay, Snake-Bait if you’re coming with us today, you go way up front. We will follow way behind.” Eventually, we found some other work for him to do. But the closure to that whole story was almost exactly a year later, about 200 meters from that spot. I was still in pain from my back although it had got a lot better to the extent that I could sort of walk. So one afternoon we were out in the jungle looking at different rocks. And I was climbing up a really steep cliff and it was getting dark. And the camp was just over the back of this steep ridge. There was one guy gone ahead of me who was cutting a basic path through the vegetation which was mostly small saplings on the jungle floor. I was crawling up this big chunk of roots. And as I pulled myself over the top of the ridge and there right in my face was this cobra poised to strike. I spontaneously threw myself backwards and I must have gone down quite a long way. I was sailing through the air backwards thinking, “Oh dear. I’m going to stake myself on one of the saplings”, because they cut them with a real spear point at the end of them. Fortunately I landed on my two feet and screamed out, “Snake!” All the guys shot off in every direction. And then this little bugger of a snake came down from three or four meters up the cliff and chased me. 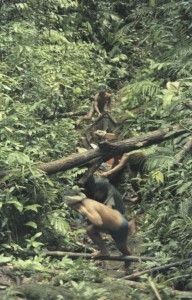 I got a super blast of adrenalin and ran up the hill and beat every bush Dayak going to escape the snake. Exhausted, I stumbled back to camp, fell in the river, cleaned up and went to bed. And then the next morning, I woke up sleeping on a little mattress and said, “Oh, something is really different. What is it?” And the ache in my back that had been particularly acute in the morning had gone. Mansur: Yeah, so all the Dayaks were joking, they love these kinds of situations, “Oh, you know, so it was the big snake’s little brother who came to fix you up.” For them life is constantly under threat and the way they cope with it is to joke about the extraordinary circumstances under which they live. They’re the most self-entertaining people I’ve ever met. So I was always on the same level with them. I don’t know how I learned the trick. I mean it was very easy because I lived my life in their houses, ate their food and travelled in their canoes, they were my exploration team. So we were all on equal terms and I certainly never had the kind of managerial systems in place to be clocking in and clocking out, but we’ve managed it very much on that basis and now here we are wanting to start again and haven’t had anyone at work for four years other than our core team, but they’re all flooding back and all keen to work again. These people are black and white. They either love you or hate you; they don’t know our world of compromise. Bapak once said to me, “The important thing with these people is that you feed them really well and treat them well and then they’ll do anything for you.” I mean we all still have to learn and adapt on both sides, and gradually of course we have brought them up to safety regulations, for example. I mean early on they wouldn’t want to wear shoes or a safety helmet. Harris: And from the earliest days of the mining there was always an informal kind of social welfare aspect, wasn’t there? You always used to do things like helping with their education, didn’t you? So, it wasn’t like there was a big community liaison program in place but you spontaneously tried to help. Mansur: Those really early years were quite a dilemma for me, being the first guy going up the river. It was like, “Oh-oh, here I am Mr. Coca Cola.” Because they started asking for things like watches, and I used to think about that – what is it that we can do to really help these people into a future that’s destined to come? I mean, there’s going to be development whether anyone likes it or not. Frankly I knew they’re far better off with us in Subud as the people with a greater vision and mission, Bapak’s vision and mission for Kalimantan, than with anyone else. So that was the justification for me for being there. But then it just came to me, well, the single thing that we can do is give them education because I’ve came to see how unbelievably smart they are, how uncontaminated their intelligence was. You can take someone who has never seen a water pump before in his life, and you say, “This, this, and this and you start it like this, then you do this.” And they’re like, “Oh, OK, fine.” They’re very quick because they have survival instincts and survival logic. These are real bush people constantly living on the edge of survival. So we started what we called the Kalimantan Kids Club which was initially funded by Murray and I and then others joined, such as Michael and Mariam David, and Susila Dharma. We started giving scholarships and that’s now been absorbed into Yayasan Tambuhak Sinta (YTS), the foundation that Bardolf Paul runs, and I think over the years we helped something like 150 kids through varying levels of schooling and higher education. Yeah, I really came to that singular thing. The only one thing we can give here is education. Because only then they’ll have means to really participate in whatever unfolds. And be real participants and not just observers. They will have the means to do it. So one thing led to another and we actually set up the foundation. We started Kalimantan Kids Club about 1990, and then we setup YTS in 1997. And then in 2002 we managed to attract Bardolf to come. In 2006 we established Bina Cita Utama which now schools 100 kids and has become greatly appreciated and valued by local people and government, it’s done much for Subud’s image in Central Kalimantan. More than 400 Subud members have financially supported BCU over the past 6 years and helped it to a near breakeven point. Our next project is to build a school campus that will accommodate 350 students. Hamid da Silva has donated 10 hectares of land to help facilitate this. Bardolf came in with a new approach and built YTS up to what it is today, recognized internationally and by local government as a community development approach which is quite unique. Which actually brings about real measurable successes, and everyone these days is looking for measurable results. YTS has developed collaborations and funding from more than 20 international Aid Agencies including UNDP, UNIDO, UNTAD, Ford Foundation, AusAid from the Australian Government and the Global Environment Fund. YTS is a world header today in reducing the use of mercury by local miners. Freeport, who of course have social problems with their mine in Papua, like everyone these days acknowledge just how important community relationships are. The mineral project will fully fund and support all our YTS community programs this year and that funding will dramatically increase along with exploration success into millions of dollars annually. This is a massive bonus for us as YTS embeds most of our social development objectives and vision. 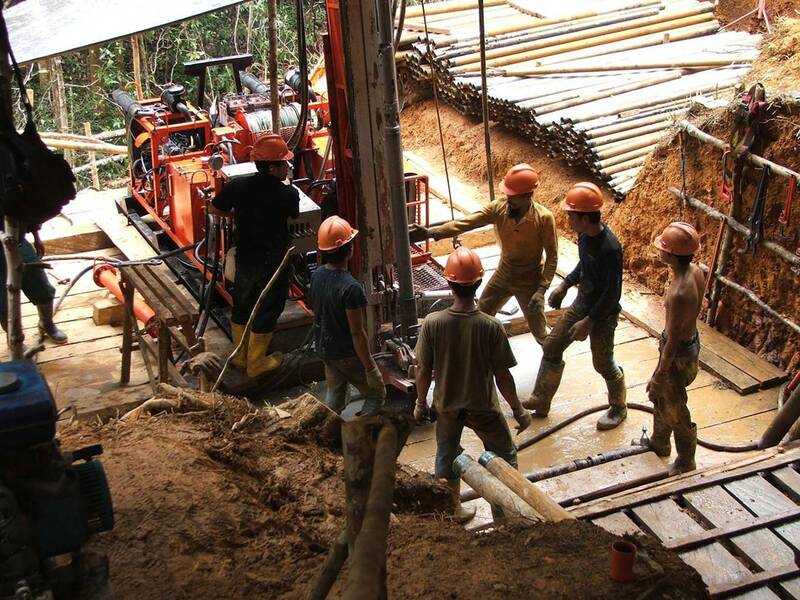 Our partners recognize that this social asset is as valuable as our mineral prospectivity. We started really early on this aspect of relationships. It began with my very first years going up the river in their boats and in their canoes and eating their food and developing a trust and a genuine respect.. I mean, these guys still ring me up, and if the word goes out that we’re back at work, they’ll be saying “Oh, we heard you’re going back to work?” “Yeah.” “What can I do?” It is basic human nature to want to be appreciated. Usually they just contract with an outside company to do the job. We believe that in the long run there are far greater benefits by training local people to do the work and directly benefit from the project. My friend who wanted to work as a watchman is now in Jakarta training as a lab assistant so he can help in preparing all the rock core drill samples we will produce for analysis. At the end of the day, people living in remote and underdeveloped regions firstly want the opportunity to have good livelihoods, education and health services. What many environmental groups and agencies don’t seem to realize these days is that if you actually provide these things you have a far better likelihood of establishing meaningful environmental conservation. If people have a good livelihoods they are far less likely to cut down trees or dredge up rivers for gold to feed their families. 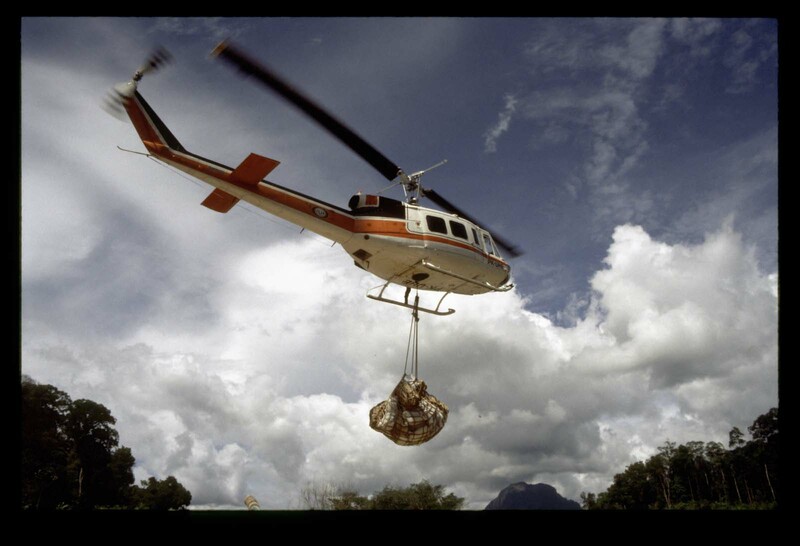 Its these activities that are most destructive to the environment in remote places.. In the final article in this series, Mansur talks about the prospects now that KGC has joined with Freeport. 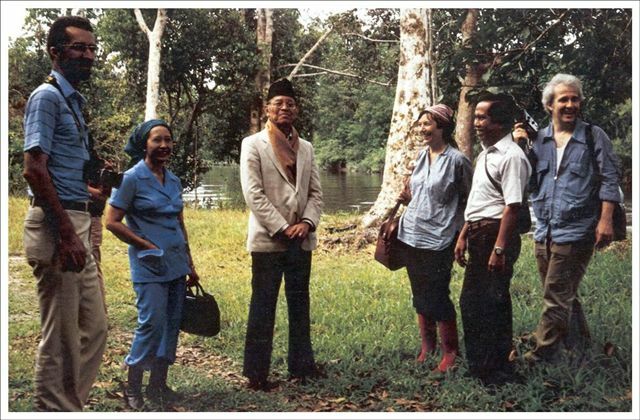 Bapak in Kalimantan during his visit in 1980... it all goes back to him. 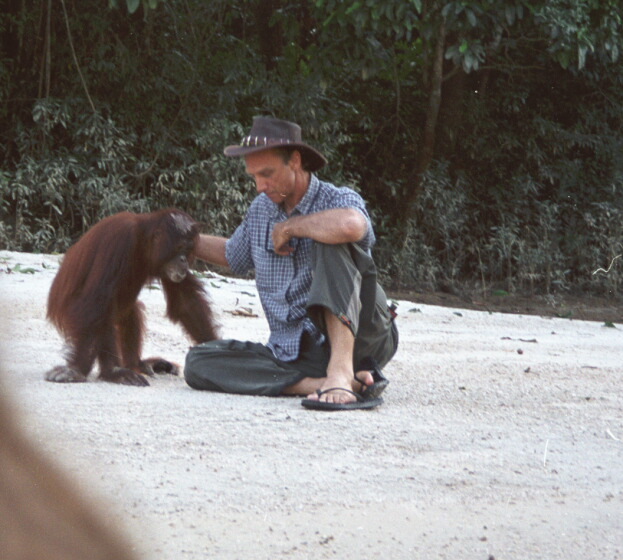 Harris: Your whole Kalimantan endeavour has been very much based on following Bapak’s advice hasn’t it? Mansur: 1981 was the first year I started working in Kalimantan. If I had been an accountant I would have never gone. Bapak was a hugely courageous and surrendered man. He understood and received the truth and the need into the future. He said we would require billions of dollars, well, those billions are now available through our partners, but if I had thought about what we were embarking on back then I would never have started. Back in those days when I first went to Kalimantan it was mostly mythological Dayak tales about where the gold was. It really wasn’t meaningful geological data. 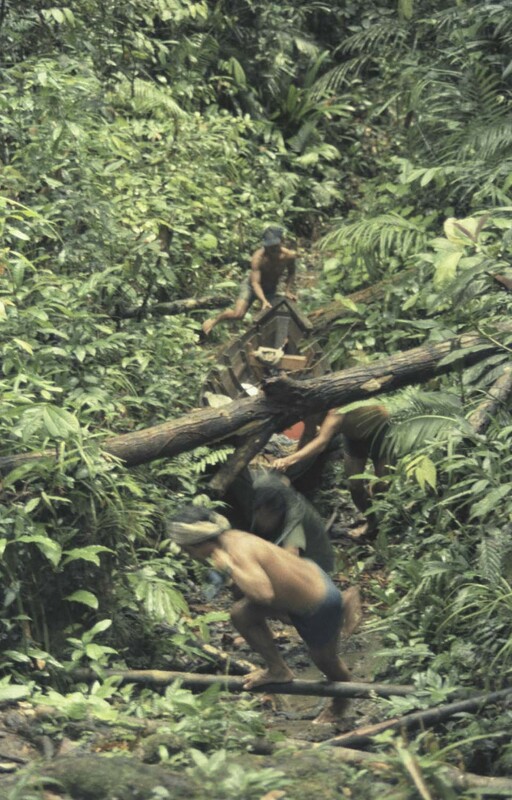 The Dutch had done some remarkable work in some places – they had a gold mine in a place called Tewah on the Kahayan River – but much was still uncharted territory. We were certainly the first white man explorers who went into some of those places. On my first trip I just had an insane time for two months in the jungle.. I went back to Jakarta and the minute I arrived, I thought I was having a heart attack. I just collapsed. I was a strapping lad of 27, at the peak of my physical condition, and I suddenly couldn’t breathe. I managed to pull myself together and it gradually passed. So the next day I went to see Bapak who always knew when I came back and liked to hear the latest stories. It was 7 o’clock in the morning and he called me to his bedroom and he was in his pajamas. So I told him the story. And he said, “Now you understand the strength of the material forces. You went native. You enjoyed every minute of it and you dropped all your material defense’s, the forces that most people use to operate in the city, the big commercial world. But it was on the Rungan River that I got really sick. A young Indonesian Subud guy who liked to dabble in magic with me got possessed and the Dayaks had a selamatan for him, including a shaman, a dukun. They tried to exorcise the spirit which involved the sacrifice of a couple of pigs and ten white chickens. I had to be smeared in pig’s blood, being a Muslim that wasn’t entirely cool and it went on and on and on. Then a bunch of renegade Dayaks who wanted to seal the gold dredge shot at us, I was attacked by a large snake and things got worse and worse. My entire body got covered in little pimples in each pore. It was a very jinnie place and as though jinn and man literally co-inhabited the same space. Mansur: Yeah, shocking. This shamanistic ceremony was three days long and I wasn’t allowed to go home the whole time. Harris: Did the ceremony do the possessed Subud member any good? Mansur: It helped, but he had to go home, which meant I was left in the middle of the jungle alone with two pretty wild Dayaks. The Jinn in Kalimantan acknowledged us. At least, they acknowledged Bapak according to what he said and I have no doubt about it whatsoever. And I had my own experiences about that, that they considered Bapak, the Jagad Guru, the Teacher of the World. Bapak always loved to hear my adventures because it was kind of like I was his experiment. I knew it was like that. And, of course, those were my very special times with him. And he said one time, “Yeah, just remember whenever you’re there and off in the jungle, just repeat within your inner self, you are Bapak’s son. And everything is fine because the Jinn are looking after you anyway.” Apart from anything else, his attitude showed a deep respect for local beliefs and customs. I once met a dragon; it was huge, about 300 meters long. He was living in an unexplainable clearing in the far north of our concession, known as The Mohot, which is steeped in Dayak mythology and considered the land of the Jinn. There are no people there. I was in a helicopter and we intended landing in this rare clearing, which so happened to be the dragons resting place. As we approached, he reared up and was about to shoot us out of the air with a fire ball. Then we connected inwardly and he said, “Oh it’s you,” and just went back went to sleep. I screamed at the pilot, “Don’t land there we can land on the sand bar in the river, it’s much better”. This huge green and red creature knew who I was. After that Rungan incident, I went home to Bapak, and I told him the whole story. I said, “You know the remarkable thing? If I think about it now, I almost shudder with what I went through. But when I was there, I just felt like an observer. I felt in no way as if I was really a part of it. Sitting on the floor and being smeared in pig’s blood. I kind of felt like I was in some drugged state, or like I wasn’t really there.” I never felt heavy or frightened. Bapak stood up and walked around the room and sort of gazed into the beyond and then he said, “So you’ve been really blessed. What you came to experience during these two or three months was how to live, breathe and work continuously in the state of latihan. And the fact is that’s the real purpose of Kalimantan.” It doesn’t mean others have to go through what I did. For all of us who are willing to go there with the right kind of attitude, that state is available. Of course, we should be able to tap into that anywhere in the world, but I think everyone who presently lives there, or who has been there, feels this special pull to Kalimantan. There’s a state, or an environment, that’s available to us, an inner and outer environment that allows us to be continuously in latihan. As long as we have, the right attitude. If you go over everything Bapak ever said about Kalimantan, it really was like grandpa talking to kids. He never really made any great designs. He gave indications, but it’s up to us to develop it step by step. Really it’s a very logical process. What he said to us was go there with trust, surrender, submission and courage and work and work our butts off. And if you are able to do that and be in that right state, then God delivers. Your opportunities are open. And there are things that you can never expect. You can’t plan it. You can’t think about it. You just engage with what you believe is the right thing, and work sensibly. You don’t need the money necessarily. Kalimantan has taught me our greatest potential lies in our ability to be open to All of Mankind. The daily proof of the latihan is in my work, walking the walk. Not thinking about it. Towards the end of his life Bapak added courage to his “Trust Surrender and Submission. I believe the courage he meant was to truly have trust surrender and submission in every moment of our lives, like him. These qualities are action qualities not qualities of discussion. Of course today times have changed dramatically from when we first started. But that component still is there. 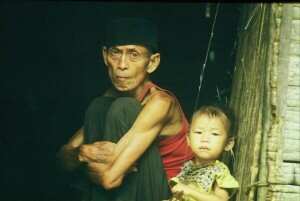 We could have only survived through Bapak’s guidance, and through belief and persistence. Just keep going. It’s not a dream. And I think finally after 30 years, the acknowledgement of Freeport, which is possibly the third biggest mining company in the world, confirms it. KGC drilling in the pioneering days. But then 18 months ago we started talking to them again, and they were starting to think otherwise. We had this new very high-end geophysical data that they did for us, through very sophisticated computer generation of magnetic data. And even then they said, “Wow, yeah, it’s looking really good, but we have one very large super-profitable headache in Indonesia and we don’t want another one.” That was a corporate decision back in America, but fortunately we got to know the guys here in Indonesia, and one of them was particularly excited about it and he generated the continuing interest. The work they have done for us looks deep below the surface of the earth and shows the potential mineralizing intrusions we have known must be there all these years. It’s been a bit like an unveiling of the beautiful lady below. We knew that what we had been finding must have something driving it, a driving mineral body that we were finding big surface expressions of. And that’s entirely normal. So this guy from Freeport insisted on having the data redone to six kilometers deep. This is something they had done in Papua, and on a number of other already existing mines, and a very specific model comes out of it. It happens that these big copper and gold deposits in this part of the world, the Southwest Pacific Rim, correspond to this magnetic model. They all have a very high magnetic signature, whereas in America, they don’t have any. It’s the opposite and that’s just the wonderful way of geology and nature and the way things are. Why it should be like that no one really knows. It’s a mystery of nature. Only in the last few years has this been fully understood. Just five years ago we had a joint venture with another company but they simply didn’t drill deep enough. They proposed that they were going to do that but they never did, which was a huge disappointment. But they claimed that if it was not sticking out of the ground, it’s not economic. That was when copper prices were $1500.00 a ton. Now it’s $9,000 a ton. And Freeport happened to be the company that invented a method of mining where they mine in these huge deposits underground which conventionally and historically could only be mined downwards. They go deep, deep down and they mine it upwards, and they can do it at similar cost to an open pit mine. So you know we all wonder why and why now. The struggle of hanging on for 30 years has been a super tough one. The sacrifices of everyone involved in the project, even our staff has been enormous. Working for minimal or no salaries is hard when you have a family to feed and educate. It has been hard for Subud members or non-geological people to understand. I mean, these types of ore deposits are really huge. You need to find one that is economic, meaning its grade is high enough to make a profit at the current price. You start off with a big gamble, and the price is cyclical; it goes up and down, up and down. Right now we have an all-time high on both base metals and precious metals. These high and maintained prices are largely the result of demand created by China, India and other developing nations. We’ve taken a lot of criticism from some Subud members who feel we haven’t done what we should have done, but they have never really understood the size of what we are doing and the resources that are required. That’s the reason we went to Canada because there are people in the market there that understand high risk exploration. Some think Subud should have a bigger piece of the pie, well if you don’t put up the money needed to cook the pie you cannot expect to eat it all.. and I can assure you the pie is very large. Armchair critics and Subud snipers produce very little that is positive or realistic, just distrust. Bapak used to say, “Never talk about something unless you have experienced it. Otherwise it’s just hot air”. Murray (Clapham) God Bless him was always a big help to us. He was my pillar of support from almost the beginning. I started working in Kalimantan in‘81 and Murray joined us in about ‘85. He helped us organize our first joint venture with people in Melbourne. At that time, Australia was looking at Indonesia as an investment opportunity. Rahman Connelly who has recently resigned as CEO was a driving force in our successful negotiations with Freeport. Both these guys contributed millions to the project for no reward and little gratitude. So it’s been an entirely linked-in, step-by-step process which we could have never mapped out, though good times and bad times, but now we have the enthusiasm of Freeport to really get on with it and drill these mammoth holes. There are only a very small handful of companies who have the resources to do what is needed. And that’s what I don’t think some Subud members have ever quite grasped. We're going to be seeing more of these. Harris: You mean you’ve never really had those resources before that you really needed to do the job? Mansur: Yeah, we’ve hung on and hung on, but up until now it’s been underfunded. I think we’ve spent to date a total of something like $18 million, but now this year alone we will spend $5 million and next year if we have the encouragement we hope for it will be an open book. It might be $20 million, it might be 30. It will all depend on whether we get the excitement in results that we all hope for. We sure need lots of prayers to bring that home. It has never been and still isn’t a foregone conclusion that we will succeed, but now we will be drilling holes 1500 meters deep which cost in the vicinity of $800,000.00 to a million each. It sure isn’t junior stuff anymore. We have reached that point. Freeport has absolutely acknowledged that everything we have done is exceptional. They were very surprised, because often junior companies lose their data or move on to other things. Mining people are always asking, “Why have you stayed there for so long?” And as a geologist I said, “Well, when I see mineralization over an area of 50 kilometers by 50 kilometers, and I’ve walked all over it and it’s everywhere, why look anywhere else. I know that where you find smoke, there’s bound to be fire.” It has to be down there it’s a matter of the cost to find it. As a Subud member I have simply believe in what Bapak told us. A copper mine is different from a little gold project. You’re looking at expenditures of maybe initially a total of $20 million in feasibility studies and a total of maybe $100 to $200 million to develop a gold mine. The things we’re looking at now a copper gold mine, well, the feasibility alone might cost $200 million. And the development costs may be $5 billion or $6 billion. These type of mines last 20 or 30 years. And as it turns out, this new analysis work we’ve done with our partners has showed things that Mathew and I worked on and discovered many years ago. In fact, , things we discovered in the first five years, But now we have the capacity to drill million dollar holes, to have a helicopter at $250,000.00 a month to run things up and down to the site. It’s no longer for small players. The other huge benefit we get from the project is that it will fund our YTS programs, which embed most of our Subud development goals. This could translate into many millions annually in the coming years. These types of mining projects create whole cities and underwrite the development of a region like Central Kalimantan. That’s the opportunity ahead. I do hope Subud members are able to participate and benefit from such a development. It will require more walking than talking. So the next year will either give me a happy ending to my book with a big future, in fact a new beginning, or otherwise it will just be an adventure story of 30 years. Either way the journey has been great, for that I’m truly grateful. Harris: Bapak’s words have always been your guiding light haven’t they? So if you want to fulfill Bapak’s hope for the lives of all of you here, then Bapak hopes that you will really make enterprises. Brothers and Sisters, the enterprises that are required by the jiwa of each of you are not small enterprises but large ones. Are you really capable of setting up and running large enterprises? Are you really able to do that, when one can say that you are on a level that is not so high or so strong, materially speaking? The example for this is Bapak himself. The project Bapak is organizing in Kalimantan will require, if we work it out in the way an accountant works it out, capital or money amounting to at least a thousand million dollars. Where will Bapak find that money? If you calculate it, it is impossible for Bapak to do it. Then why is Bapak doing this? Because he has received the order from Almighty God. This is something of which Bapak has really convinced himself and Bapak has truly understood how it works. In Kalimantan, for example, everywhere there is gold, in the rivers which flow there is gold, silver, copper and diamonds and precious stones. It is everywhere. So it’s clear, Brothers and Sisters, God provides for all the needs of man, it only depends on man as to how he works and acts. So, don’t be fearful. God is Almighty and All-Great. If we are truly convinced of this, then it is from there, from the latihan kejiwaan, that we will find something that we can use, a way that we can follow, so that eventually we can become people who have a value in this world. So Bapak’s prayer for all of you is: Do not ever cease to think of enterprises. We are already beginning to pioneer the way in this direction. We are beginning to discern the way by which we have to go: the way to happiness for all Subud members who have received the gift of God Almighty through the latihan kejiwaan of Subud. This is what will attract the people. For, in general, society, and not only society but all of you, cannot progress if there is no money or material wealth. But you Subud members are not like that. The richer you are, and the better your inner feelings, the more you feel love towards your fellow human beings, the more compassionate you are. You have to express this compassion so that society can draw a conclusion from our actions, from the fact that we use our funds to help others through charitable undertakings for the benefit of mankind. But don’t forget that social democracy should not be only on one’s lips, but must be put into practice. Such is God. The enterprises Bapak is constantly pushing are not for pursuing wealth and money, but for organizing our own selves. This concludes this three part series of interviews with Mansur.